Uechi Ryu Karate is a family style that comes from Okinawa but its roots are in Southern China in the Fuzhou region of Fujian province. It was shortly before the turn of the 20th century that the system’s originator Kanbun Uechi spent approximately 13 years in Southern mainland China, where he apprenticed himself to Zhou Zi He who was a master herbalist and master of five martial art styles. For 13 years Kanbun Uechi learned Tiger, Dragon and Crane styles. After receiving his teaching certificate he taught in China for a few years, later making his way back to Japan, and Okinawa. The heart of his teachings which remains to this day are three forms called Sanchin, Seisan, and Sanseiryu. 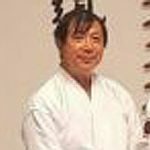 After his death, his son Kanei Uechi added five additional bridging kata leaving today’s style with a total of eight forms. 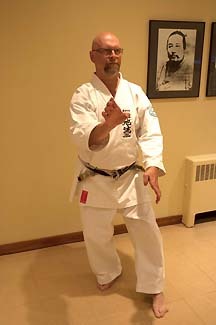 Uechi Ryu is a combat system, rather than a sports oriented style. Virtually all hand and foot technique’s contained within the forms use pointed weapons and open hand techniques called Kaisho. The reason for this is that the system evolved for self-preservation and militia-related purposes, with its goal self-preservation in adverse circumstances. Its kicks are low, stances upright, stability a premium. It’s a close-in style wherein the opponent’s defenses are breached to allow fighting from one arm to grappling distance. For this reason it’s often called “telephone booth” karate. Another attribute of the system is its emphasis on grabbing and striking, pulling the opponent inward while the strike is extended powerfully outward. Emphasis is on knowledgeable striking, rather than striking for its own sake. Targets of opportunity depend on openings given or created, but they are chosen by their chance to be “fight-enders”. Within Uechi Ryu as well as other styles there are fight-interrupters and fight-enders. Interrupter’s can be used as part of an incremental or sequential sequence of techniques used to incapacitate and defeat the attacker. However it’s critically important when facing multiple attackers or one with a weapon for the unarmed practitioner to be able to reliably defend themself. This can be done only if you have hardened weapons, knowledge of striking points and the ability to access vulnerable points accurately, with sufficient force. Uechi provides the curriculum and it’s up to the student to study with proper information, intention and intensity to make it a reality! The eyes, the windpipe and the male external genitalia are common among other points that that are difficult for the attacker to condition, and include the carotid sinus and the brachial plexus in the neck, the femoral artery, vein and nerve as each enters the thigh, and exit above the knee. The fascia lata of the thigh, the median and radial nerves of the upper extremity are also important for disabling the attacker, and for control. Striking the medulla oblongata and midbrain is a fight-ender resulting in incapacitation and unconsciousness of the attacker. It uses minimal concussive and rotational force and is easily applied, and without warning from within Sanchin arm position, at very close range without windup or chambering. All techniques are shot from wherever the Uechika finds themself, and this is most often upright within Sanchin stance. The expanding learning of the Uechi canon never ends, providing all students regardless of rank, with a never-ending course of fascinating material and unfolding awareness. Become an Author on Uechi-ryu.com!! I forgot when I created the first martial art website. 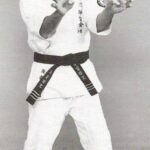 It was quite primitive to be sure, but I realized the internet was something that I should explore and make part of the Uechi-ryu community and I was eager to become part of that group of pioneers who experimented with this technology. During those years my web creations took many forms. I actually enjoyed playing around with the newest and most creative methods of communicating with the martial art world. Today marks another milestone in the Uechi-ryu website which includes newer and easier way to manage the site, enabling more of my friends and associates to contribute directly to the site’s content. This month (August, 2012) also marks the 30th anniversary of my Martial Art SummerFest! 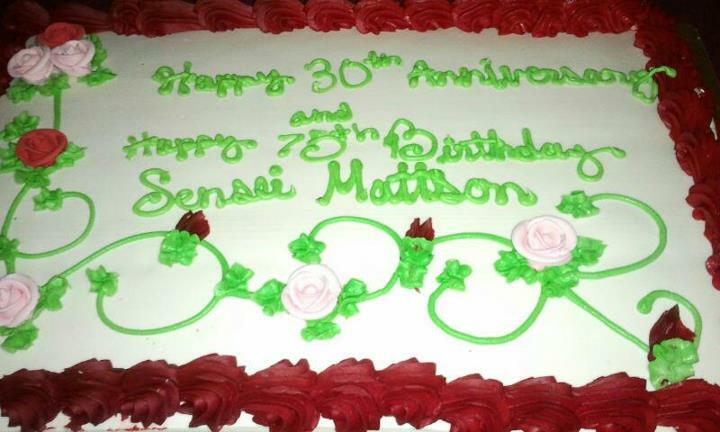 We celebrated this occasion with a record number of senior Uechi practitioners attending and a Masters Celebration with a record number of awardees. Without my knowledge, Susan and my friends decided that they should combine celebrating the SummerFest anniversary with my 75th birthday, which doesn’t happen formally until September 12th. 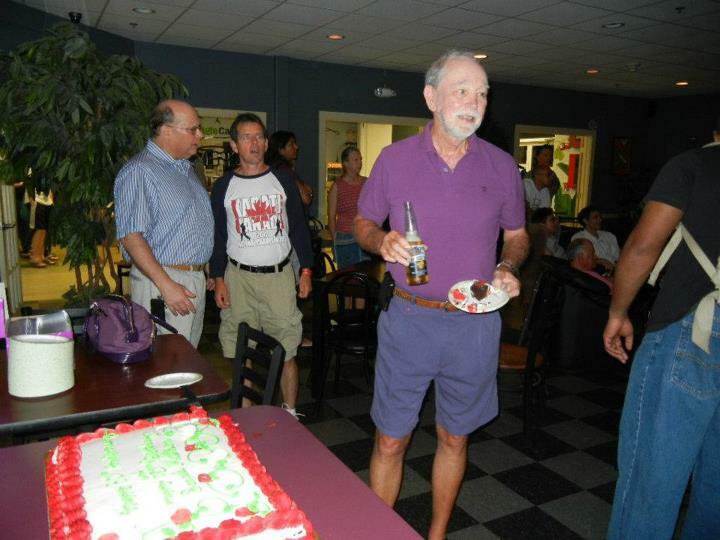 Allan Azoff decided that a dual celebration deserved a king-size cake and brought one to the post Masters Celebration party. Although I fully expect to live another 50 years, I have decided to share more of the work and responsibilities of IUKF and other martial art activities to others. In addition to creating a hard working Board of Advisors in 2000, headed by Dr. Paul Haydu, I’ve just appointed Darin Yee as Vice President of IUKF. As his first assignment, I asked him to appoint a new committee, in charge of Titles and Awards.This committee, headed up by Dr. Joan Neidi and Jim Witherell, approved three titles for 2012. I hope you enjoy the new website and will contribute to it whenever possible. Lets work together and enjoy the exciting future ahead for Uechi-ryu. Is Body Conditioning Karate’s Lost Art? Copyright remains the property of: George Chaplin, C/O Dr. N. G. Jablonski, Dept. of Anthropology, California Academy of Sciences, Golden Gate Park, San Francisco. CA 94118 – 4599 U.S.A email: njablonsk.cal.org. Biographical Details George Chaplin is an Uechi Ryu Karate Do Yon Dan, and has taught and practiced karate in Hong Kong and Perth Western Australia. He was registered at Futenma Dojo where he trained with Grandmaster Kanei Uechi, and has spent a total of one year studying on Okinawa. He spent five years as Chief Instructor of the Hong Kong Dojo with Mr. Robert Campbell Renshi who was Senior Instructor and head of the branch. He has recently moved to San Francisco. . This article is offered to the audience with the hope that it will inspire further discussion about the topic of conditioning. Here conditioning refers to the body’s accommodation to getting hit and not getting bruised. It does not mean physical or cardio-vascular conditioning. It is an attempt to explain the observation that conditioning takes place. It may or may not be the answer and although the medical implications are pondered by the author, he must point out from the start that he has no medical training. This year’s SummerFest is being featured in quite a few FaceBook posts, along with really great pictures from last weekend’s event. Just received this note from IUKF Vice President, Darin Yee. . .
Just a quick note to tell you how much my students and I enjoyed your 2012 summer fest. I’ve been involved these last 13 years and realized I should have been involved for the last 30. We had a lot of exciting and informative teachers demonstrating a lot of effective, innovative and new things for everyone to experience. I’ve been involved in the study of martial arts for over 53 years and was introduced to many new looks at how things can be done. Instructors like Rory and Bucky adds a lot of input that compliments a lot of what I’ve done and taught for many years. Paul Haydu was teaching a lot of movement involving essential body dynamics. If more instructors understand and teach all the things Dr. Haydu was teaching, their students could possible perform stronger and better kata. I personally look forward to working out with Paul Haydu again. The most enjoyable part of this week was the opportunity to rekindle old friendships and to meet our new generation of karate greats who are going to carry the torch of Uechi-Ryu Karate here in America. I felt energized to think I can and might have in some way help shape the next generation. We had another great success with Jr. Fest. We had children ageing from 4 years old to 16 years old. I’ve told the older children they could choose to join the adults rather then work out with the younger children. I was told they rater be with the younger group which was alright with me. We had one 4 year old, two 5 year old and five 6year with us. I was very surprised they all lasted the full 7 hours and was disappointed our session was over at 4pm. A special thanks goes out to Pat Saunders from the Stow Martial Arts Karate Do for being such an incredible presence and leading so many of the drills, exercises and games. She is such a phenomenal organizer and facilitator. The IUKF is very fortunate to have dedicated members like her. I also like to thank Gary Wong, Sam Balch, Jordan Littman, Brianna McCarthy, Melisa McCarthy and Joy Tierney from The Budokan Martial Arts dojo; Russ Chase from the Brockton Uechi Karate Dojo and all who has help with making this Jr. Fest something to look forwards to next year. As I’ve mentioned already, I was very surprised when the littlest ones were the most disappointed after 7 long hours of activities. Perhaps we should consider taking a separate picture of the children in Jr. Fest for next year and give them their own little acknowledgement. Probably most, if not all, of us have heard that Sanchin Kata translates as Three Conflicts. And we have certainly heard that “all is in Sanchin”, as though the key to unlocking the mysteries of Uechi-ryu is simply in practicing that very basic but all inclusive kata. Usually, at some point, we may wonder if that’s really true, if it’s possible to become a master through performing those rather simple repetitions of three steps and arm strikes forward, turn and repeat, turn back forward and repeat, and so forth. It’s a fairly generic and limited set of movements, and, while they form the basis for many of the movements that follow in the other Kata, they hardly seem sufficient on their own. So to what does “all is in Sanchin” refer ? I suggest that we remember the Three Conflicts. What are the Three Conflicts? One of the original symbols of Uechi-ryu, the three interlocking tear drops, offers an elegant answer. Whatever the conflicts are, it is clear from the symbol that they form a whole. Taking that knowledge a step further, what appears to be conflicting can offer resolution in wholeness and through integration. One of the basic series of three conflicts is Form/Speed/Power. This is the domain of the physical, an important domain. However, an overemphasis on one of those aspects usually occurs to the detriment of the others. Tried my best to post a large photo of my M.A. SummerFest Newsletter here, but kept messing up the home page. I’m tryuing to disprove the old saying “You can’t teach an old dog. . .”, but after a dozen tries, finally gave up. This newsletter will be the only information notice that will be going out to those on my mailing list. If you aren’t on my general mailing list, please Click Here and sign-up. I only send out a newsletter occasionally, and certainly would never give anyone access to my mailing lists. And if you would like read this special edition newsletter, Please click HERE. It is a pdf file, which can be opened with a free Adobe Acrobat viewer. 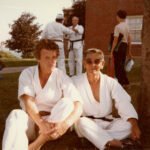 Please talk-up the SummerFest in you dojo and try to get a gang to accompany you to this year’s camp. I promise you will have a great time, learn a lot and meet the most pleasant, friendly and helpful martial artist in the world! George Mattson's Corner, How Do I. . . I don’t know about you, but my e-mail in-box is overflowing with junk messages every morning. No matter what programming trick I create or anti-spam program I buy, the “spammers” always prevail and somehow end up in my “in” box. Although a hundred or so junk e-mail get through every day, my anti-spam systems get 2-300. Not bad you say. . . Well, because my systems work “fairly” well, my “junk” box also collects about 25 e-mail that I do want to get. So guess what? I must now go through my junk mail folder every day to pull out the mail I want before deleting the rest. I just started doing this, since earlier I would just automatically delete everything in the junk folder. Until. . . I began sending my newsletters (I put out 5-10 a month) to myself as a way to check how they look using different browsers. . . Hmmm, I wasn’t getting any! Finally, after complaining to the newsletter people and getting the responce: “Did you check your junk folder”, did I discover my own mail was being caught in the spam snare. After doing quite a bit of research and continuing to watch the 100+ junk mailings get into my “in” box, I realized how inadaquate today’s e-mail process has become. George spends a long weekend in New Hampshire with Buzz Durkin and students. 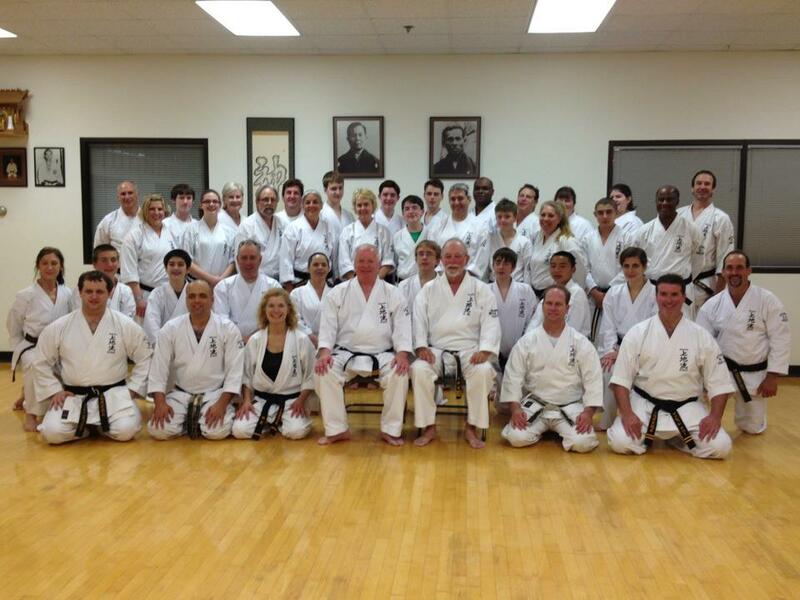 Mattson states: “I had a great time and met hundreds of dedicated Uechi-ryu students and teachers at my seminars and Saturday’s graduation ceremonies.” George arrived Thursday afternoon and taught a children’s class and a two hour adult class at Allan Azoff’s dojo in Lexington, MA. Friday, he enjoyed a round of golf at the Atkinson Country Club, where he stayed. 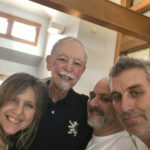 Friday afternoon and evening he spent at Durkin sensei’s beautiful Atkinson, NH dojo, spending an hour with the children’s class and then teaching a two hour seminar to a packed house. Robb Buckland conducted a fascinating “realist” seminar at the Atkinson dojo on Thursday evening. Saturday was a busy day for everyone, expecially for George and Buzz, who posed for pictures with every one of the nearly 200 black belt recipients who were awarded their belts at the evening ceremonies. Buzz thought that everyone would want to have a photograph representing four generations of Uechi-ryu and based on the number of students who took advantage of this opportunity, they did! Obviously, the weekend wasn’t all work. 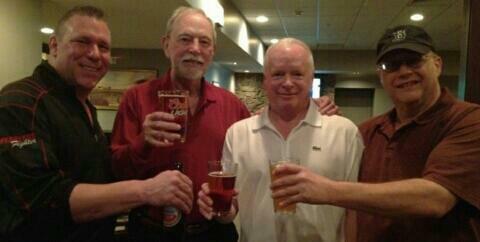 Here Robb, George, Buzz and Allan enjoy a brew following the Thursday night seminars at the Atkinson Country Club.